Before the establishment of St. Peter's in 1839, the Mass was not regularly celebrated on Staten Island. In fact, Catholics on the island had to travel to either St. Peter's in Manhattan or St. James's in Brooklyn if they wished to partake in the Mass on a regular basis. Bishop Hughes, after considering that the Catholic population on the island had grown to around 100 people, decided that a parish should be established on Staten Island. Father Ildelfonso Medrano, an exiled Spaniard, was assigned by the bishop as St. Peter's first pastor on April 1, 1839. St Peter's Church is the oldest Roman Catholic parish in New York City and part of the Roman Catholic Archdiocese of New York. 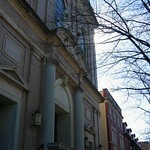 The church was designated a landmark by the New York City Landmarks Preservation Commission in 1965. The original church's cornerstone was laid in 1785 and the first solemn Mass was celebrated in 1786. This was nearly three years before George Washington—standing less than a mile away on an open-air balcony of Federal Hall (the nation's first capitol)—took the oath of office as the first president of the United States. The cornerstone of the present Greek Revival church, designed by architects Thomas Thomas and John R. Hagarty, was laid in 1836. The exisiting church was completed in 1840. St. Raymond's Church is a Roman Catholic parish church under the authority of the Roman Catholic Archdiocese of New York, located at Castle Hill Avenue at Tremont Avenue, The Bronx, New York City. The parish was established in 1842. It is dedicated in honor of Saint Raymond of Penyafort, a 12th century Catalan-Spanish saint. The Church of St. Rita is a Roman Catholic parish church under the authority of the Roman Catholic Archdiocese of New York, located in Staten Island, New York City. The Church of St. Roch is a Roman Catholic parish church in the Roman Catholic Archdiocese of New York, located at 602 Richmond Avenue, Staten Island, New York City. It was established in 1922. The Church of St. Teresa of the Infant Jesus is a Roman Catholic parish church in the Roman Catholic Archdiocese of New York, located at 1634 Victory Boulevard, West New Brighton, Staten Island, New York City. The church was built 1953 to the designs of the prolific architect Robert J. Reiley of Robert J. Reiley & Associates. In November 1884, the Rev. James Donahoe was sent to establish the Parish of Saint Thomas of Aquinas in South Brooklyn, the 47th parish in the Brooklyn Diocese. The first Mass was celebrated November 16, 1884 in a building on 9th Street near 5th Avenue. St. Virgilius Roman Catholic Church in Broad Channel, Queens is a simple wooden frame building, located on Noel road. This is one of two churches in Broad Channel.